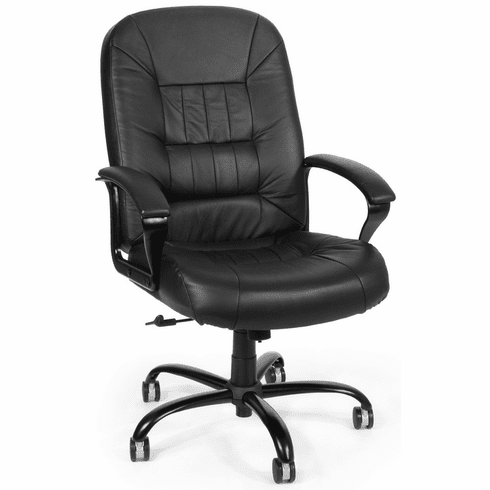 This gorgeous leather executive chair from OFM is tailor made for people big and tall! The extra thick foam seat on this OFM office chair is made with comfort in mind, and the heavy-duty construction of these chairs are safe and stable. This first-quality big and tall chair provides an incredibly luxurious look and feel. Features include a 400 lb. weight capacity, Top quality black leather, Hi-density 5 1/2" thick seat foam, 3/4" plywood seat frame, Gas lift seat height adjustment, 360 degree swivel mechanism and Durable painted steel armrests with leather pads. Meets or exceeds ANSI/BIFMA safety for office chairs. Limited lifetime warranty from OFM. Dimensions: Seat Size: 22"W x 21"D. Back Size: 21.5"W x 28"H. Seat height adjustment: 18.5"-22"H. This 800-L big and tall office chair normally ships in 1-2 business days from our NC warehouse.